Redditch Entaco wicketkeeper Brandon Weal, pictured fielding against Burghill, Tillington & Weobley, made an impressive 63. Picture by Marcus Mingins. 2617006MMR2. REDDITCH Entaco will be chasing a fourth successive Worcestershire League Division One victory when the campaign reaches the halfway stage at Colwall on Saturday. The Kingfishers’ seven-wicket home win over Burghill, Tillington & Weobley on Saturday was routine in the end, but Russell Southwick’s side were made to work hard before taking a grip on the game. However, another 20 points in the bag cemented fifth spot and leaves the Bromsgrove Road outfit just 22 points behind leaders Bewdley, who tied at Stourport. Having won the toss, the Herefordshire side started well and put on 90 for the first wicket as captain Ben Owens hit a fine 58, supported by Ben Parkinson (45). The Redditch bowlers remained patient though and took their opportunities to restrict the visitors to 196-9 off their 50 overs. Greg Chinn continued his excellent season by taking 2-29 off ten overs and Waqas Ali claimed 2-37. In reply the Kingfishers lost Chinn early on but Tom Field (77no) and skipper Southwick (28) set a platform. Kiwi Brandon Weal (63) put on 112 with Field as Redditch eased home in the 37th over. SECOND placed Redditch Entaco 2nds continued their pursuit of Division One 2nd XI leaders Feckenham with a 40-run victory at Coombs Wood. Redditch amassed an impressive 279 as Geoff Eley led the way with 72, Haleem Basharat made 46, Tom Phelan 44 and Yassar Altar 42. Coombs Wood remained in contention as James Andrews (56) impressed but the wily Nick Fowkes rolled back the years with 4-40 as the home side were bowled out for 239 off 49.1 overs. Colwall visit Bromsgrove Road on Saturday. Both the 3rds and 4ths enjoyed excellent victories to complete a full house for the club, beating Harborne away and home respectively. The 3rds won by three wickets in Division Five after bowling Harborne out for 129, with Ajmal Wafa taking 4-32 and Warren Bisp 3-33. 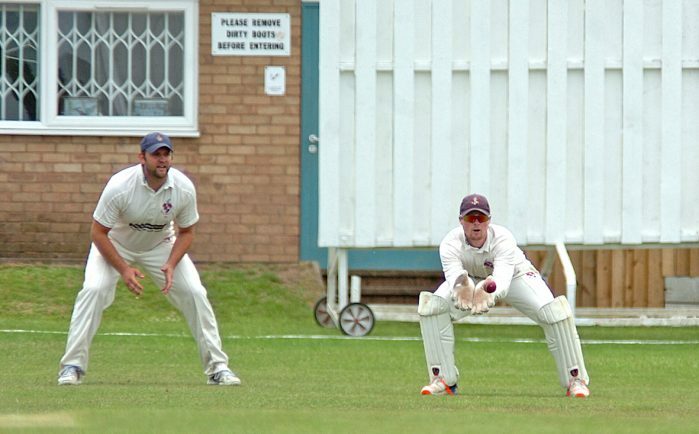 Skipper Liam Phelan (50) and Sam Bonsall (43) then saw Redditch home in 29 overs. In Division Five 2nd XI at the Entaco, the 4ths won by 60 runs thanks to a match-winning performance from Zeb Khan who scored 61 not out batting at nine to help Redditch to 195-8 off 45 overs. Harborne were then dismissed for 135 as Khan took 3-3 off four overs and Amaan Malik claimed 3-17. Both the 3rds and 4ths sit mid-table ahead of Saturday’s fixtures against Old Hill.